As negotiations between LA Unified and its teachers union, UTLA, stumble along with still a wide gap on salaries, two Bay Area school districts, have made significant progress in their own deals with teachers. San Francisco teachers have agreed to a double-digit raise over three years while Oakland teachers are in line to get at least the same. 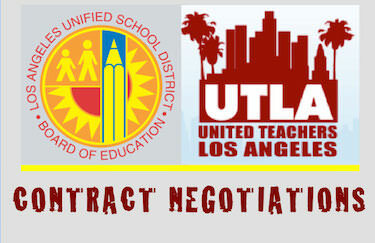 While contract negotiations through December have narrowed the gap between LA Unified and UTLA in raises, the sides remain far apart. On Dec. 17, UTLA announced it had reduced its latest salary demand to a 9 percent raise over 1 year, from a demand of 10 percent, while the district held to its offer of a 2 percent raise with a pair of one-time bonuses. On Dec. 12, the San Francisco Unified school board approved a 12 percent raise for teachers in a three-year deal, while Oakland Unified’s superintendent on Dec. 17 announced he would like to offer teachers a raise of as much as 13.7 percent over three years. Negotiations in Oakland are set to resume this month. The news is significant for LA Unified, the largest district in the state, as San Francisco is the sixth largest district in the state and Oakland is the the 12th largest. Also significant is that Oakland and San Fransisco, along with LA Unified, were recently ranked near the bottom of the largest districts in the country in salary over a 30-year career in a report by the National Council on Teacher Quality (NCTQ). When the cost of living was considered, San Fransisco ranked 123rd, Oakland ranked 120th, and Los Angeles 94th out of 125 possible rankings. UTLA President Alex Caputo-Pearl found the NCTQ report significant enough to mention to the LA Unified school board at its meeting on Dec. 9 when he was giving an update on the contract negations. A story by Oaklandlocal.com found that teacher turnover in Oakland was twice the rate of the national average. In conciliatory comments on the issue of pay, Oakland Superintendent Antwan Wilson said that the raise offer would directly impact the quality of education for the district’s students. “The foundational principles of putting students first means recognizing that students come to us with great gifts and we need to put their needs first when making decisions. It means we must give every student what they need,” Wilson told Okalandlocal.com. “Our work starts with our people. We must recruit the best talent, create a system that cultivates their growth,” and incites effective teachers to stay on, he said. Wilson also said that the district would have to make “sacrifices” for the raises to happen. Meanwhile, the rhetoric from LA Unifed has not been nearly as conciliatory on the topic of teacher salary as in Oakland. In a letter to the LA Unified school board in December, Superintendent Ramon Cortines warned that raises must be based on “available resources,” and pointed out that the district is facing a $326 million deficit next year.